The process of making jerky is quite a simple one and can be broken down into the following 4 steps. First start by selecting your desired meat. 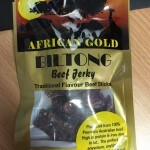 Jerky can be made from a variety of meats except pork. 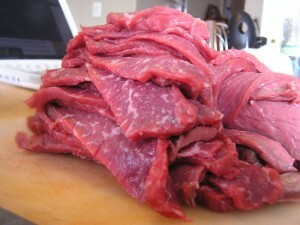 The most common meat is a lean beef cut, usually topside. It helps to first snap freeze your meat for 30 to 60mins. This will make it a lot easier to slice. Once ready, remove the meat from the freezer and place on a cutting board. You will want to slice the meat about 1/4 of an inch thick (about 6mm) and most importantly cut WITH THE GRAIN. This will make it a lot easier to eat, and the meat will hold together better. Once all your meat has been sliced, trim any fat from the meat to avoid spoilage later. There are two ways to marinate your meat, either a dry rub using just a cure and spices, or a wet marinade. Which method you choose to use is up to you. It is recommended that meat be marinated in your special recipe for a min. of 24hours in a sealed snaplock bag in the fridge. Once your meat has marinated, remove it from the fridge. 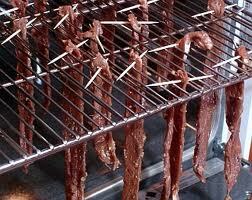 There are several methods of dehydrating your meat. You can simply use a standard kitchen oven set to 60 degrees celcius. Ensure the oven door is left open throughout the process to allow air to move around and thus complete the dehydration process. Drying times really depend on your heat, thickness of meat and the water content of the meat. Approx 6 to 7 hours should be sufficient, but just keep checking until you are satisfied. The drier it is, the less water content and chance of it spoiling quicker. 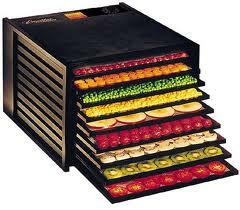 The other option is using a electric dehydrator. These can be purchased from many homewares stores and come in a wide range of sizes and types. There is the circle stacked types and the rear fan forced types. Once the jerky has been dried out, let it cool off before packing it away in bags. 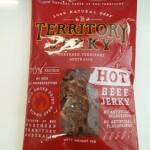 The heat from the jerky can be kept inside and cause condensation in your packets. Jerky should be kept in a cool dry location, once opened it should be either consumed or kept in a fridge. 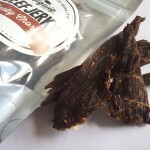 Many people choose to put their jerky in the freezer to keep for future use.